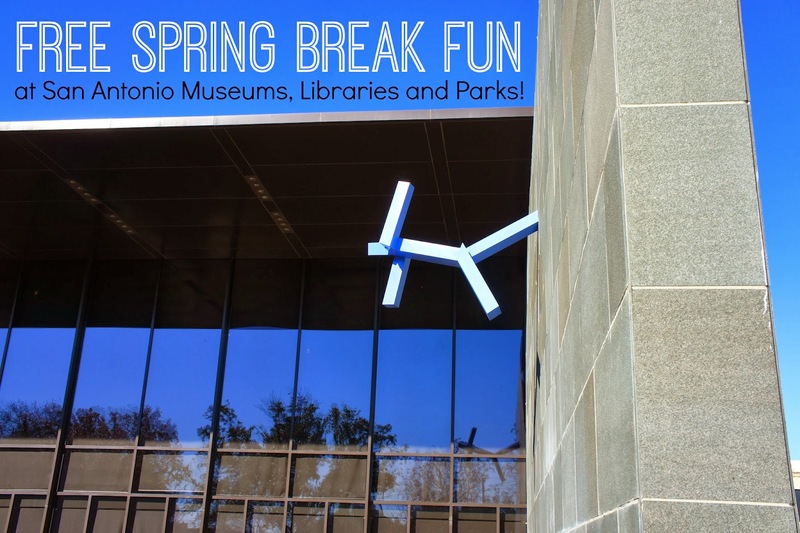 A Free Kind of Spring Break: Family Days at the McNay, Libraries and Parks! So...Spring Break is here! And blah, blah, blah...I am a working mom and can't take off any days off. Monday - Volunteer. With many events happening later in the week, I think it would be a great day to give back. The SA Food Bank Kids Cafe seems like the best bet for us because they allow ages 8 and up to volunteer. You have to register prior and it can take up to 3 business days to get a response, so keep that in mind. Because we have not registered as volunteers, next on my list would be a visit to a park we have never been to before: Hardberger Park. My friend Colleen at San Antonio Mom Blogs has described this park as paradise, so I've got to see what it's all about. Check out her pictures from her latest visit! Tuesday - I'd start off at the Spring Break Event at Las Palmas Library. The Literacy Caravan is going to be there from 12-2pm. The Caravan is a mobile learning center and kids can participate and leave with a free book! After, I'd head over to enjoy a Free Day at the San Antonio Museum of Art. From 1-6pm, there will be free family fun event, titled Lights, Camera, Action. And I hear a food truck will be there! Wednesday (and also Tuesday 2-4 and Thursday 2-6) - We will make our way to the Spring Break Family Days from 2-4pm at the McNay. Artist Robert Indiana's iconic LOVE sculpture is on display right now and families can create stamps, signs, symbols and stencil prints. There will be an interactive Pop poetry slam and “Indy 500” pushcart derby on the museum grounds. Lots to do! Then, I think it's dinner at Chipotle down on Broadway! Thursday - Maybe a visit with the grandparents and a picnic at Landa Library. This library is is in the beautiful Monte Vista neighborhood and has a playground! There will be a Family Literacy Event and the Literacy Caravan is going to be there from 2-4pm. Friday - I think a bike ride on the Misson Reach is in order and then a visit to the connecting, Concepcion Park. 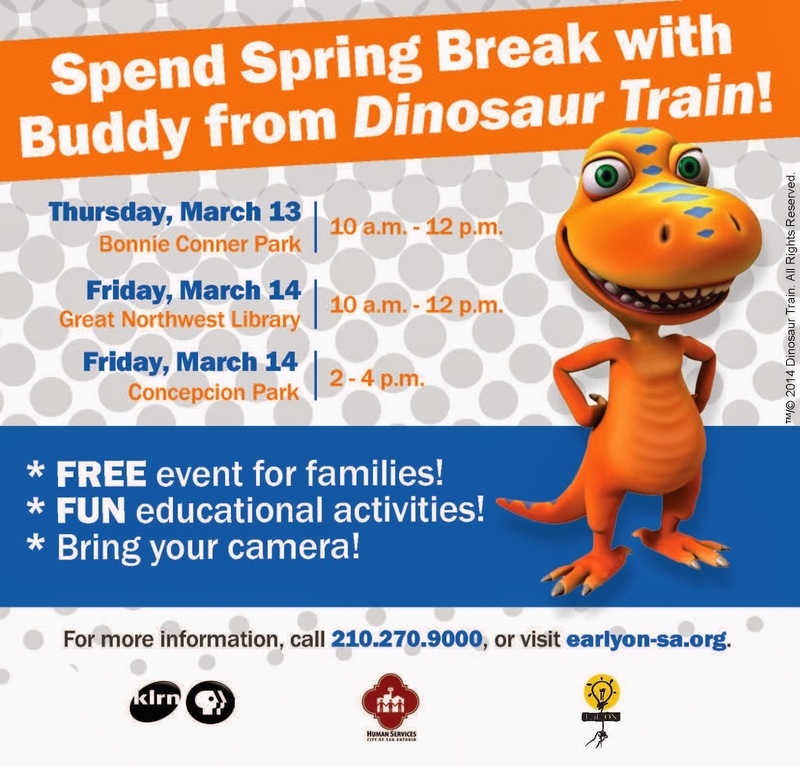 KLRN is hosting a family event there from 2-4pm with Buddy from Dinosaur Train. For more Spring Break fun, check out San Antonio Mom Blogs' How to spend Spring Break 2014 in San Antonio.